Allela invented Sign-IO as a way for himself and others who cannot sign to communicate with the deaf - in Allela's case, with his deaf niece. The glove recognises various signed letters and transmits this data to an Android application, where it is then vocalised. "My niece wears the gloves, pairs them with her phone or mine, then starts signing. I'm able to understand what she's saying," Allela told The Guardian newspaper. Allela said the speed at which the signs are being vocalised is one of the most important aspects of the smart gloves. "People speak at different speeds and it's the same with people who sign - some are really fast, others are slow. So we integrated that into the mobile application so that it's comfortable for anyone to use," he continued. The app also allows users to set the language, gender and pitch of the audio voice, with accuracy results averaging 93 percent. It can be packaged in any style the user wants. "It fights the stigma associated with being deaf and having a speech impediment. If the gloves look cool, every kid will want to know why you are wearing them," says Allela. So far, Allela, who is a Royal Academy 2018 Engineering Leaders In Innovation Fellow, has received recognition for Sign-IO from the American Society of Mechanical Engineers (ASME), the world's largest organisation for mechanical engineers, by winning the Hardware Trailblazer award at its 2017 ASME Innovation Showcase (ISHOW) competition. Allela is also on the shortlist for the 2019 Africa Prize for Engineering. 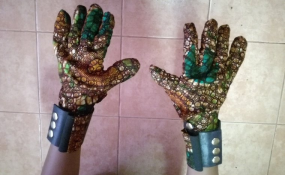 The young engineer's goal is to place at least two pairs of gloves in every special-needs school in Kenya and to eventually be of help to the 34 million children worldwide who suffer from disabling hearing loss. "I was trying to envision how my niece's life would be if she had the same opportunities as everyone else in education, employment - all aspects of life," says Allela. "The general public in Kenya doesn't understand sign language, so when she goes out, she always needs a translator. Imagine that dependency over the long term; how much that plagues or impairs her progress in life. When it affects you personally, you see how hard people have it in life. That's why I've really strived to develop this project to completion."